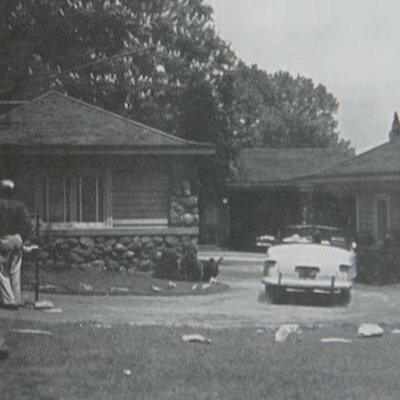 I recently blogged about the “Fake” Rainbow Cabins that was seen in the 1952 movie, “Niagara” starring Marilyn Monroe and as a result a number of people have asked for more information on these cabins. 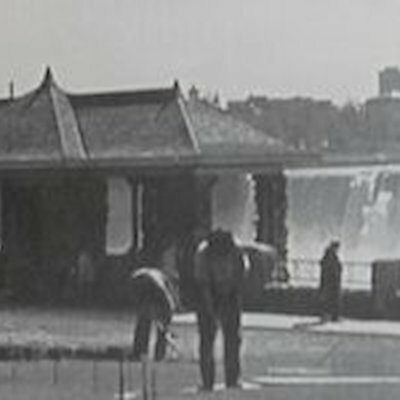 About 25 carpenters were employed for the construction of four complete exterior cabins and one complete cabin located in Queen Victoria Park directly opposite the American Falls at a spot called, “Inspiration Point”. There was already a small stone outlook on this location. This stone building is no longer here because it was removed in the 1970’s for safety reasons. There is however a similar looking stone building located at a falls look-out called “Rambler’s Rest” just north of the original “Inspiration Point”. Once the movie was completed these cabins, which cost $26.000, were removed. These cabins were so authentic, enquiries looking to rent the motel that Marilyn Monroe stayed and continued for years. Here are a few photographs from my collection of workers removing sod to begin construction of the cabins and another shot of one of the scenes being filmed at Rainbow Cabins. Another one show Jean Peters and Casey Adams, who both appeared in the film, presenting a Honeymoon Certificate to the 10,000th couple to be issued this type of certificate by the Niagara Falls Chamber of Commerce.